When traveling to Maui visitors have many options in a place to stay, as there are literally hundreds of condos/resorts on the island. Click the link below to see some of our favoirite Maui Lodging options. The average couple spends countless hours planning a wedding. Plus, the average wedding involves 20 vendors. Just imagine trying to contact and organize 20 vendors from several thousand miles (and a few time zones) away! 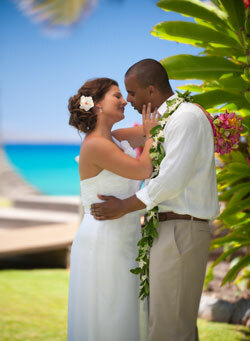 You undoubtedly can become stressed, overwhelmed and frustrated very quickly when planning your Maui wedding. Is that the way you want to feel leading up to your dream day? Probably not. That's why hiring a Maui wedding planner is so important. Our #1 goal is to make your dream wedding a reality. Then you can relax and enjoy the experience of a lifetime. Believe it or not, our wedding planners can save you money. When we find an outstanding vendor we continue to do business with them. Those relationships allow us to secure the very best services and the most favorable pricing. We're in the know. A simple online search for the term "Maui Weddings" results in thousands of resources! You can spend hours just scouring those results to find reputable vendors and useful tips about Maui weddings. Why bother when you can just ask us? We already know where to find the prettiest flowers, the tastiest cake and the best officients. We have planned hundreds of Maui weddings — from small beach weddings to large estate weddings. We know what to expect leading up to your event and what can happen on the big day — and we're prepared for it all. You don't want to deal with the ceremony set up, the caterer, the lost sock, the timing of the toasts and/or dances, etc. Your time should be spent with your family, friends and spouse on such a magical day on Maui! Regardless of your budget we want to work within it. A budget doesn't mean our creativity needs to be stifled but rather just the opposite. We're pros at stretching dollars and resources to create your vision. Plus, we know where you can skimp and where you should splurge. So instead of fussing and stressing over the details, contact us today. We can't wait to meet you and your soon-to-be-spouse! So instead of stuffing receipts in an envelope that you dread opening, contact us today. We can't wait to meet you and your soon-to-be-spouse! Details, details, details. Planning a wedding is all about details — the dress, the flowers, the cake; we could go on forever. However, there are two details you definitely don't want to overlook — getting your marriage license and certificate. Many people don't realize that there is a difference between the two, so let's take a minute to clarify each. A marriage license allows your Maui wedding to take place. Once you receive the license you can get married at any time within 30 days (after which it becomes null and void, and you'll have to reapply). When working with us we will help you through the process otherwise, here are a few tips. Complete and submit the application ahead of time. Click Here to download. Have a valid driver's license or state ID, passport, etc. Bring $70 in cash when applying. If you have been previously married you need to bring proof of a divorce or death if it is within 30 days of your wedding. Show up together (proxies are not allowed) to apply. Bring your marriage license to the wedding so that the marriage officiant can sign. Special instructions apply if you are under 19. Contact us for details. Luckily, a wedding planner could probably complete this process in his/her sleep, allowing you to focus on other things. If you're not working with a planner simply call the Maui Department of Health Office at (808) 984-8210 to find a marriage license agent. About 60 — 120 days after your "I Dos" you'll receive a certified copy of your marriage certificate, which is proof that your marriage is legal. Contact the Hawaii Department of Health if you need a copy sooner or for a replacement copy. Lots of newlyweds request an additional copy to include in a scrapbook or even to stick on the fridge! Expeditied copies require an aditional fee. Our wedding packages also include a decorative wedding certificate. There is nothing more magical than a Maui wedding. Contact us today for some planning tips and/or for more information on how to obtain a Maui wedding license. We love taking care of the details for our soon-to-be-newlyweds! Getting Married On a Maui Beach? You'll Need a Permit For That. If you have ever been to Maui then you know all about the beautiful beaches. In fact, Maui has more than 50 beaches - many of which have been recognized as some of the most stunning in the world. It's no surprise then why so many couples choose to say their "I Dos" on Maui's breathtaking beaches. However, don't forget about one crucial detail — obtaining a beach permit (also known as a Right-of-Entry Permit). This is different from a marriage license, which allows you to get married on Maui. Rather, a beach permit is a legal document that allows us to hold an event on unencumbered state beaches. Some beach areas such as the entire Kaanapali resort is off limits to beach weddings. All of our wedding packages include beach permits. Remember structures such as chairs, tables and arches are not permitted at the beach. Exceptions are made for guests with physical limitations. Posession or consumption of alcohol is strictly prohibited by the state at beach weddings. If you are solely planning your wedding, then here are some tips when obtaining a beach permit via Hawaii's Department of Land and Natural Resources. For questions regarding the Right of Entry Beach Permitting Program, contact the Department of Land and Natural Resources at 808-587-0439, or Contact us and we will take care of everything. Working with a wedding planner? Then you can kick back and enjoy another mai tai because we do all of the legwork in obtaining a beach permit for your Maui wedding. The hardest part may just be deciding which of Maui's gorgeous beaches you want to get married on! This predicament is also a reason to consider working with a Maui wedding planner — We will listen to your requests, get to know your personalities, and suggest several beaches that would be perfect for your big day. Plus, we know where Maui's most popular beaches are and where the most secluded beaches are (oh and we probably know how to get to each and every one). Ready to say "I Do" to a wedding planner? Contact Maui Beach Weddings and Events today to handle all of the details for your big day! When traveling to Maui visitors have no difficulty finding a place to stay, as there are literally hundreds of options on the island. When planning your Maui wedding, however, consider the following. Is each guest responsible for his/her lodging? Do you want to stay in an all-inclusive resort? How far away do you want to be located from your Maui wedding location? Can you have your wedding where you're staying? If a small ceremony, do you want everyone to stay together (house or condo for example)? Are you traveling to Maui during peak times (costs are higher)? When you have most of the answers to these questions start to shop around. Depending on the date of your wedding, most resorts and hotels allow you to block off a certain number of rooms for guests. There are beachfront hotels as well as hotels a few miles from the beach (which are usually cheaper). You can even find hotels further away from the action located in a secluded rainforest such as in Hana or upcountry Maui. Alternatively, you can stay in a condo, which you can find availability for through a variety of online vacation rental websites such as Craigslist and VRBO (vacation rental by owner). Don't forget to mention your Maui wedding! Lots of hotels and rental owners offer discounts or can upgrade you due to your upcoming nuptials. We can connect you with an exprerienced travel consultant specializing in wedding parties and group discounts. There are also some plantations and estates on Maui that make wonderful Maui wedding locations. Several of these locations also offer lodging which is not only convenient but also memorable, as many of the homes are historic. Whatever type of lodging you decide on, remember to book ahead since Maui is such a popular tourist destination. Obviously, the more flexible you are with dates the better deals you can obtain. Remember that nearly all lodging is less expensive on Maui during off-peak times — April, early May, October, early November and late January. If you're trying to save money then definitely consider traveling during these times. Last but not least, ask a hotel or rental owner if there are one or two weeks that they would like to get booked. Believe it or not, owners would rather give you a deal and know that the location is booked for an entire month as opposed to having three weeks booked in April and two in May. The lesson? It never hurts to ask. Contact us today for some recommendations or click the link below! We're Getting Married, And You're Invited! We bet that nearly all of your friends, family and even acquaintances would like an invite to your Maui wedding! With all of that anticipation building, how will you formally invite guests to your wedding? Invitations are a great way to continue building excitement for your Maui wedding, and to set the tone for your big day. We have a variety of images that can be used for your invitations. Contact us for details. Flowers: Hawaii is home to some of the most beautiful and fragrant flowers on Earth. Consider including images of flowers on your invite — whether as a border, a background image or as the main focus. Popular flowers are the hibiscus, plumeria, bird of paradise, orchids and palms. Landscapes: Maui's beaches, waterfalls and sea cliffs are breathtaking and can make any invitation stunning. Hawaiian Lei: The traditional Hawaiian lei, which is made of flowers and leaves, is a symbol of love and respect and often used in wedding ceremonies. Sea Life: Getting married on the beach? Then consider incorporating sea life into your invitations such as turtles, which are considered sacred in Hawaii. Not many people hang on to wedding favors. However, giving your guests a favor unique to Maui can definitely change that. Cookies: Maui has some amazing and delicious cookies that come in a variety of flavors including macadamia nut and coconut. Plus, you can find cookies in island shapes such as pineapples or wedding shapes such as bells. Nuts: Macadamia nuts are a local love on Maui. You can get them covered in chocolate, roasted, salted - even BBQ-ed. Soaps/Lotions: Give your guests some of the creamy coconut lotions and sun blocks that are made right on Maui. You'll also find tropical flavored lip balms and fresh fruit filled soaps. Coffee: Locally grown Maui coffee is popular world wide. A great local pick-me-up for your guests. Lavender: Maui is home to the Kula Lavender Farm, which produces soaps, oils, candles, spices, syrups/jams, cookies and of course, beautiful lavender flowers. Feeling overwhelmed by all of the details that go into planning a wedding? We can help! Contact us today so that we can start planning the most magical day of your life! This Day Is All About You! We don't like cookie cutter weddings! Your Maui wedding should be unique and represent you as a couple. So get creative and let your personalities shine! Here are a few of our favorite additions to a Maui wedding. Don't let this list stop you — the sky is the limit when planning your magical day. Flower Circle: We love this option. It is guaranteed to add a tropical flare to your beach wedding and helps you claim your prefered beach location. Celebration Toast: Enjoy a chilled cider toast to celebrate your new life together. Sand ceremony: Blending grains of sand to symbolize your lives joined forever. Dove Release: Doves have long symbolized eternal love, peace and purity. You can release one dove or a 100 at your Maui wedding. The release typically happens at the end of the ceremony, but you can so do at your discretion. Butterfly Release: Butterflies represent a major life change, which is why their release has become popular at weddings in recent years. Release two, 10, 50 or more— the choice is yours. Hawaiian Dancers: Traditional Hula dancers are a great way to add some island flair to your Maui wedding. Why not offer hula lessons to guests? Alternatively, you can have fire dancers at your big day — or maybe both? Hawaiian Processional: Incorporate a Hawaiian tradition into your wedding! The blowing of a conch shell marks the beginning of the ceremony while a traditional hula dancer performs to the Hawaiian Wedding Song. Walk down the aisle to the Tahitian drum dance. Ice Sculptures: Even though Maui can get pretty warm, if it's ice sculptures you want then that's what you'll have. Maybe you want a palm tree, dolphin or even a life-sized bride and groom! Photo Booth: Say cheese! Allowing your guests to throw on some silly accessories and cram into a photo both always makes for memorable photos. Plus, the photos make great wedding favors! Seriously, we love weddings. We enjoy discussing details, and how to make your big day everything you've imagined. So contact us today for some tips and tricks to ensure your Maui wedding is simply magical! Practice makes perfect; and what bride doesn't want her wedding to go as smoothly as possible? That's why we recommend having a rehearsal prior to your Maui wedding. This is typically an additional charge not included in your ceremony package. If you're working with a wedding planner from Maui Beach Weddings and Events then we'll organize the rehearsal for you; you just need to show up! We want your Maui wedding to be as magical as you have always dreamed. That's why you'll find us behind-the-scenes on your wedding day ensuring everything goes as planned. Contact us today for a quote, and then start packing because your Maui wedding will be here before you know it! Your big day is finally here — Congratulations! A Maui wedding is a once-in-a-lifetime event, and one that should be stress free. However, many brides don't anticipate all of the details that go into the actual day, which we planners call "day of services." Hence, why working with a wedding planner — even if just to ensure things go smoothly on the day of — is so important. Here's a brief overview of Maui Beach Wedding and Events' "day of services." We don't know of too many brides who want to wake up early on their big day to set up the ceremony/reception sites and corral all of the vendors — florists, caterers, officiants, musicians, hula dancers, etc. And don't forget about after the event. Our planners stay late to ensure the location is returned to its original state and vendors get paid. You then, get to continue celebrating your Maui wedding! You never know what's going to happen on your big day. As much as you plan, planning for the unexpected is nearly impossible — unless you've planned hundreds of Maui weddings like we have. Our planners come prepared for any hiccups that arise. We also keep your day on schedule — from the timing of the ceremony, the first dance, toasts and speeches, to dinner and dancing. Additionally, we provide you and your wedding party with a detailed schedule so that everyone is on the same page. Plus a zillion other things! Whew — that's a lot to think about! So contact us and let us think about all of the details. We guarantee that our services will save you time, money and best of all — stress. Traditions can be a big part of a couple's wedding — whether the bride wears something blue or faith-based traditions are incorporated into the ceremony. If you're getting married on Maui you may be wondering if there are any special Hawaiian wedding traditions. Well you've come to the right place! All of us at Maui Beach Weddings and Events have planned hundreds of Maui weddings and love sharing our favorite Hawaiian wedding traditions. 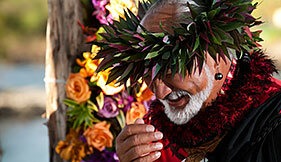 The Lei — The traditional Hawaiian lei, which is made of Hawaiian flowers, signifies love and respect. The lei is likened to the wedding ring, as its circular shape represents your bond and eternal commitment to each other. Typically, a couple exchanges leis in the beginning of the wedding ceremony with an explanation about the lei's significance. Additionally, it is not uncommon for a couple to present their parents with leis as a sign of honor and respect. Members of the wedding party usually wear leis as well. Flowers are abundant on Maui, and they are some of the most beautiful on Earth. Many Hawaiian brides forgo the typical veil for a garland of flowers around her head (Haku). Attire — White is worn at Hawaiian weddings with the bride wearing a white flowy dress that moves with the winds. The groom wears a white flowy shirt, white pants and a red sash around his waist. As mentioned above, the groom wears a lei made of green maile or Ti leaves around his neck. Music — Hawaiian music is unique and romantic. The ukelele and slack key guitar are the two most popular Hawaiian instruments. The traditional wedding song - Ke Kali Nei Au — is usually played at the beginning of the ceremony. While Charles King wrote the song in 1926, it's most known due to Elvis Presley's rendition in the movie Blue Hawaii. The blowing of a conch shell, which sounds like a trumpet, is also used to mark the beginning of a traditional Hawaiian wedding ceremony. The Feast — A traditional luau typically follows a Hawaiian wedding. However, couples can choose to combine their favorite foods with traditional Hawaiian foods such as kalua pork, a variety of fish, sweet potatoes and fresh fruits. When incorporating Hawaiian traditions into your Maui wedding, you want to get them right. Doing so can be difficult and overwhelming — especially if you are planning your big day from afar. That's why many Maui brides work with Maui Beach Weddings and Events. Our number one goal is your happiness. So call us! We love sharing our love of the islands, and how you can incorporate the Aloha Spirit into your big day! Be Nice to the Beaches! Not all beaches are open for beach weddings. For example the entire Kaanapali resort is off limits to beach weddings. Structures such as chairs, tables and arches are not permitted at the beach. Exceptions are made for guests with physical limitations. Posession or consumption of alcohol is strictly prohibited by the state at beach weddings. Remember to obtain a permit for your Maui beach wedding. All sandy beaches in Hawaii are open to the public. Be mindful of this when determining which beach you'll marry on and at what time. Do Not direct beachgoers or ask them to move. All beaches are public and we need to share. Do not leave trash or any other items on the beach that weren't there before you arrived. Don't throw trash or any other items into the water as this can harm the sea life. If you encounter a seal, turtle, whale or other sea creature give it space, as many of the species are endangered. Hawaiians also believe turtles (honu) to be sacred. Do not feed the sea life. When in the water do your best not to step on, move or kick coral. It is the main food source for much of Hawaii's sea life and in some cases, is thousands of years old. Do not remove any fish, coral or other sea creature from the water. Doing so is illegal and disrespectful. Refrain from taking any lava rocks or black sand from the beaches, as Hawaiians believe this is bad luck. Planning your Maui wedding from afar can quickly become overwhelming. If you're not yet working with a Maui wedding planner consider doing so. Besides stress, we can save you time and money. So contactl us today, and learn how we can make your Maui wedding unforgettable! Chances are, your bridesmaids and groomsmen are some of your closest friends and family. Typically, a bride is responsible for purchasing her bridesmaid(s) gifts and the groom is responsible for his groomsmen's' gifts (with a lot of input from the bride, of course). Traditional gifts include jewelry, barware, photo frames, tote bags and golf accessories, to name a few. When in Maui, however, consider giving your bridesmaids and groomsmen something unique to the island. Here are a few of our favorite Maui bridesmaids and groomsmen gifts. Hawaiian Jewelry —Hawaiian jewelry features flowers, sea life, island life (pineapples, flip flops, palm trees) and freshwater pearls to name a few. You can also purchase personalized Hawaiian jewelry by getting your bridesmaids and/or groomsmen's names translated into the Hawaiian language. 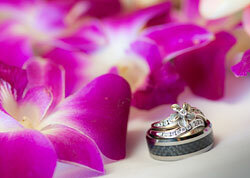 Take a few minutes to check out the gorgeous Hawaiian wedding rings too! Maui Experiences — a necklace is nice but why not treat your wedding party to a once-in-a-lifetime Maui experience? Think about a deep-sea fishing trip, a hike through a rainforest, a beach massage, a round of golf, a helicopter ride over waterfalls or a snorkel trip. Gift Baskets/Totes — when on Maui you must go to one of the many breathtaking beaches. Creating a tote bag with full of beach essentials is a great idea for bridesmaids and groomsmen gifts. Fill the bag (you can get personalized beach bags as well) with a towel, sunscreen, magazines, flip flops, some Hawaiian candy, beach toys, etc. Photo Gifts — you can't leave Maui without taking a few hundred photos! Beach-themed photo frames make great bridesmaids and groomsmen gifts — especially if you supply the photo. You can also get a favorite photo from your Maui wedding transferred to canvas or to a variety of novelties such as mugs, key chains and T-shirts. If you have some time you can also create a photo book of your Maui wedding/vacation or give your wedding party gift certificates to create a photo book. Need more Maui wedding ideas? Contact us today for some recommendations on how to make your big day just as magical as you've dreamed. Considering having a theme throughout your Maui wedding? Themes are a great way to tie all of the elements of your wedding together. Plus a theme can bring out a couple's personality (we know you've seen the Star Wars weddings). Remember that a theme doesn't have to be blatantly obvious and present in every area of your wedding. Some couples choose to have a theme run solely throughout the reception, for example. Here are some of our favorite themes we've seen throughout the years. The beach — having a beach or island-themed wedding is obvious on Maui since gorgeous beaches surround you (making the decorating easy). You can opt for a luau-type reception complete with a tiki bar and fire/hula dancing. Many couples also incorporate traditional Hawaiian food like roasted pork, tropical glazed chicken, taro pudding or chips, poi, sweet potatoes, and fresh tropical fruits like pineapple, mango and lilikoi (passion fruit) into the menu. Adventure — say "I Do" underwater, in a helicopter, on horseback or alongside a volcano! Hobby — we've seen couples get married in golf attire then head to the course for some tee time. Other couples incorporate their love of baseball into the wedding complete with the first pitch at the ceremony! The point of having a theme, as mentioned above, is to share your personality and/or love of something with your guests. The "big day," like your love, is unique and something to cherish for a lifetime — so go ahead and get creative. Ready to get planning? Contact us today, and we'll share some of our favorite (and funniest) Maui wedding themes! Should I Wear This? Or Maybe That? Looking good on your wedding day isn't too hard when you're surrounded by Maui's beautiful scenery, which includes teal ocean waters, white sandy beaches and eye-popping flowers. However, deciding what to wear for your Maui wedding can still be a difficult decision. A good place to start is to choose whether you want your wedding to be informal or formal. Typically, couples that are getting married on the beach opt for more casual attire such as khakis and a Hawaiian shirt for the groom and groomsmen and flowy comfortable dresses for the bride and bridesmaids (shoes are optional for everyone). Remember that Maui is often warm and windy. Guys wearing three piece suits or tuxedos can quickly become overheated. The same goes for a bride wearing a corset-style dress under the Maui sun. Therefore, brides should look for dresses made of comfortable, lightweight materials. A note to brides: don't discount short dresses — especially if you're a beach bride. You'll most likely be cooler in a short dress, which also allows you to walk along the water for photos and/or the ceremony without getting the dress wet. On the other hand, regardless of dress length, some brides can't wait to hop in the ocean dress and all! Just because you're getting married on Maui doesn't mean your wedding has to be informal. Some couples prefer their big day to be more formal — whether the event is being held on the beach or at an estate or hotel. Just be sure to let your guests know ahead of time, as not many visitors to Maui typically need to pack formal attire. As mentioned above, formal wedding attire can include tuxedos, three-piece suits and elaborate, more structured gowns. Again, due to Maui's warm temperatures, formal Maui weddings are typically held later or very early in the day when guests can be cooler. If you're looking to save money on your Maui wedding then consider renting your wedding attire. There are several bridal shops on Maui that allow you to rent a bridal gown, tuxedo or suit. These packages start around $300 — a definite savings that you could spend on seeing the sites of Maui! Additionally, many of Maui's bridal shops offer pressing services so that you're not a wrinkled mess on your big day. You can either ship your gown and/or tux, suit to a bridal shop about two weeks prior or drop the clothes off three days before your wedding. This service usually costs $50 - $200 depending on the amount of clothing and type of fabrics you need pressed. Don't forget about fit! 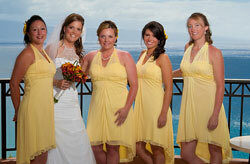 Bridal shops on Maui also offer alteration services that can be completed in three days or less. So if you find that dream dress the night before you're flying to Maui, don't worry! Contact your wedding planner who can recommend a great tailor who can get that dress picture perfect in no time. Some tailors and bridal shops offer delivery services. Need some more tips for your Maui wedding? Contact us today — we love talking details! What's the Best Season to Get Married on Maui? Some brides think a little rain on a wedding day is good luck while others don't want a drop of precipitation coming anywhere near the big day. Luckily, the weather on Maui is somewhat predictable. Hawaii is on the edge of a tropical zone and therefore really has only two seasons — both of which are warm. In fact, the temperature is between 78 degrees in the winter and 85 degrees in the summer months. The dry season is between April and October and the rainier season is between November and March. However, rain on Maui is typically brief and passing. Areas on Maui that are almost always sunny and perfect for a Maui wedding are Kihei and Wailea on the south side of the island and Lahaina and Kapalua on Maui's west side. Contact us today with any questions about Maui's weather, peak travel times and of course, Maui weddings! You Set a Date, Now You Need a Time! Did you know that the typical Maui wedding is a small beach wedding? Not surprising, since there are dozens of beaches on Maui that feature simply breathtaking views. We often get asked though when the best time to get married on Maui is. Well, are you and your partner morning people or night owls? Remember that Maui is beautiful 24 hours a day! We recommend strategic planning when choosing the time of your wedding. Keep in mind that most beaches on Maui are open to the public. Also keep in mind that the temperature can become very hot very quickly. Therefore, if you'd like to get married in the morning we recommend doing so before 9 a.m. That way the temperature is mild, and the beaches aren't too crowded with beachgoers. Morning weddings on Maui are unique in that everything seems "fresh and new." The flowers are blooming, the birds are chirping, the grass is glistening and your surroundings are calm. You can then hold a brunch for your reception or relax on the beach and hold a night reception. Sunsets on Maui are amazing. The colors in the sky resemble those in a crayon box — blues, purples, oranges, reds and combinations of all four. We recommend that you hold your ceremony one hour prior to sunset. That way you can have a comfortable ceremony with enough time afterward for the most amazing wedding pictures. Remember that Maui sunsets are popular among locals and tourists — so there will be more people around than during a morning ceremony. However, if you are working with a wedding planner they can help you find the perfect and most private spot for your big day. Have You Picked a Planner? Couples love working with us because we know all the great spots to get married on Maui (ones you won't find on the Internet). Plus, we can help you choose between a morning or evening ceremony, and how to make either the best day of your lives. So contact us today to find your perfect Maui wedding location! Travel Arrangements — Here Today, Gone to Maui! While we arrange the details of your big day, it's time to make the arrangements to get to Maui and find the perfect accommodations for the lowest price. Our Travel Service Agent will help you located the best resort, condominium, hotel or vacation home you will remember forever. If you want to bypass the hours or even days of searching for the cheapest airline tickets or where to rent the least expensive car once you arrive, we completely understand. Leave it to the professionals to handle those details for you. Our agent has established contacts on the island during her many trips to Maui and they are usually able to secure lower rates for services you will require once you arrive. Let them answer all of your questions about Maui and arrange everything you need to make your visit just as perfect as your wedding day will be. A perfect place to start is with Hawaii Destination/Romance Specialist, Linda Dancer with Honeymoons Inc. She has spent the last 20 years researching and traveling to the Hawaiian Islands. Linda truly listens to what you are searching for in Maui that will create the wedding, and vacation of your dreams and then she builds it for you. Maui Adventure Weddings — Book Yours Today! Just How Adventurous Are You? Thousands of couples get married on Maui every year. However, not as many choose to say "I Do" underwater or in a helicopter! But if adventure is your game, then there's no better place for one than the breathtaking island of Maui. Most couples hop into a limo when traveling to their wedding, but on Maui you can be whisked away to your wedding in a helicopter. You'll have the opportunity to see some of Maui's breathtaking views including waterfalls, lush forests, lava fields, sea cliffs and mountains. After a short ride you'll land at an exclusive, stunning location where you'll say your "I Dos." After toasting to your day, climb back in the chopper to meet family and friends for a celebration of your love. If you're a water loving couple then what better place to get married than in Maui's teal waters? You can "go all the way" with scuba gear or don a simple snorkel. Not adventurous enough? Then say "I Do," while paddle boarding! A water wedding is unique and a definite conversation starter — just make sure you hang tightly onto the rings! Besides beautiful beaches, Maui is home to Haleakala — a dormant volcano rich with Hawaiian history. Believe it or not, the slopes of Haleakala are another great place for a Maui wedding. There are few animals more majestic than horses. That's probably why couples choose to say "I Do," while on horseback. There are a handful of ranches on Maui that are perfect for such an adventure wedding. You can say "I Do" while riding the horses or hop off and hold the ceremony at a rustic gazebo. Book Your Maui Adventure Wedding Today! Whatever type of Maui adventure you're planning, we are excited to help you put all of the details together. Just don't ask us to jump out of any planes with you! Contact us today!